Timothy B. Lee offers several defenses of surge pricing by Uber and Lyft, including this. It might seem like an obvious point, but it’s often overlooked by people who complain about surge pricing. Surge pricing gives drivers an incentive to spend more time on the road than they otherwise would. It encourages them to re-arrange their schedules to make sure they’re available on nights of peak demand. And it entices drivers who might otherwise like to go out partying themselves on New Year’s Eve to hit the road instead. I haven’t been able to find any hard data on how much higher prices increase the number of drivers on the road — a measure economists call the elasticity of supply. But there’s reason to believe that big price increases will be more powerful during nights of predictably high demand — like Halloween or New Year’s Eve — than at other times. If demand spikes unexpectedly, there might be a limit to the number of people who can immediately jump in their cars and help out. But everyone knows New Year’s Eve is the biggest night of the year for taxi service. Lyft has been sending me emails all week reminding me that I could make a lot of extra money if I drive tonight. So people who need some extra money have plenty of time to make the necessary arrangements. So, to his credit, he admits that there is no data supporting surge pricing as a means of enticing ride share drivers onto the road but suggests that surge pricing incentivizes drivers to come out. The point he elides is that it is just as likely that drivers will come out on nights like New Year’s Eve whether there is surge pricing or not. The sheer volume of ride requests guarantees more business than they can adequately serve, and consequently a profitable evening. It is not surge pricing which allows just about every taxi company in major metropolitan areas to lease all of their cabs with ease on nights such as these. To an extent the success of Uber has been driven by pricing its service substantially below the local taxi market prices. Its ability to do so derive from a substantial venture capital funded war chest as well as evasion of costly local regulations (the appropriateness of that evasion is a subject for another post). Uber’s price competition does saddle its drivers with a structure which compensates them at a level which allows for simply minimal profitability. Surge pricing is the variable which boosts drivers’ take to acceptable levels. Without it Uber might find it difficult to continue to attract and retain drivers. To put it another way, surge pricing has nothing to do with enticing drivers to offer their services during busy periods. It is an excuse which Uber uses to overcharge for rides in order to bring the total compensation of drivers to a level whichwillensuretheir continued participation with the company. It’s not necessary on New Year’s Eve but it can be spun as such in order to achieve a different objective. The problem Uber faces is consumer resistance to surge pricing. Not that riders will refuse to use their service; rather they are becoming educated and will simply arbitrageamong transportation providers for the lowest cost rather than simply punching up a ride on Uber. As taxi companies respond to Uber’s challenges and offer their own apps the ability to choose between price and convenience becomes much easier and Uber’s ability to offer its drivers the extra compensation from surge pricing is diminished. Among other challenges facing Uber will be its ability to replace the lost surge pricing income with higher fares and the concomitant effectthatwill have on their attractiveness to taxi service. Uber isn’t going away but surge pricing is, and that represents a significant challenge to the company’s business model. Sober Look presents a different take on the effect of lower oil prices on US oil production than I did in my post yesterday. They quote Scotiabank suggesting that the Bakken and Permian Basin fields are producing below break even based on current prices, while Eagle Ford is still in the black. They posit slowing drilling activity and tighter credit for independents if these prices hold. I don’t think it’s unreasonable to expect a bit of the froth to go out of the US E&P market, but I doubt that at current levels any effect is going to be other than on the margins. Interestingly, Sober Look postulated that oil prices might get a temporary boost at least domestically if the government should choose to add to the Strategic Petroleum Reserve. Such a move would present a difficult choice for an administration committed to renewables and clearly hostile to fossil fuel production. On the one hand, lower oil prices and the consequent depressing effect on production would be welcome by its enviornmental base, while lower oil prices strain the economic arguments in favor of wind and solar. Oh, and lower oil prices certainly don’t do much to dampen the American love affair with SUVs and pickups. Overall, I doubt that any attempt to boost prices will be viewed as a viable political alternative. Before Monday rolls around and the analysts start talking their book at CNBC and elsewhere, take a look at this short article on oil prices from Market Watch. Moreover, this supposed floor reflects the “full cycle costs” of production, they said, arguing that this overlooks the fact that many producers in North Dakota, Texas and elsewhere have already acquired acreage, contracted rigs and even hedged crude prices. There is probably no commodity or industry of of which the death of all or parts of it have been so routinely predicted and so consistently wrong. Most of the time the so-called experts overlook or don’t understand the technology of the industry, particularly the advancements in exploration and production. Someday, no doubt, someone is going to be right and the industry willfade away. You and I will be long forgotten when that happens. Though it’s not of great import, this story about the ACA conflicting with Americans with Disabilities Act is too good to pass up. The Cliff Notes version is that the ACA allows companies to offer financial incentives to employees who participate inworkplace wellness programs. You know, obesity, smoking cessation programs, etc. The quid pro quo to the financial incentives, which can amount to thousands of dollars, is that participants are monitored and tested to make sure their claims to abstinence are true. Well, that runs headlonginto the American with Disabilities Actwhich says you can’t make medical inquiries of employees unless its job related or part of a voluntary wellness program. Your reaction is probably the same as mine. What’s the big deal sinceno one is forced to enter the wellness programs, no harm, no foul. The Equal Employment Opportunity Commission, however, takes a different and decidedly dimmer view. Intheir universe the fact that participation involves significant financial awards obviates the voluntary nature of participation and hence violates the law. Ergo, they’re suing Honeywell and a couple of smaller companies for essentially complying with the ACA. We probably need a new cabinet level department to adjudicate diametrically opposed elements of legislation and regulation designed to make our lives better. 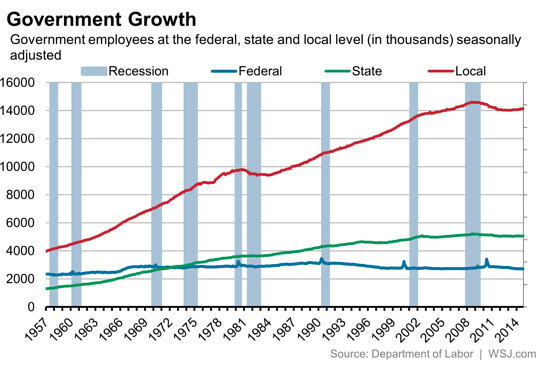 The WSJ Real Time Economics blog, hereafter to be known as the WSJ-RTE blog, attempts to make a case for a shrinking federal government workforce. 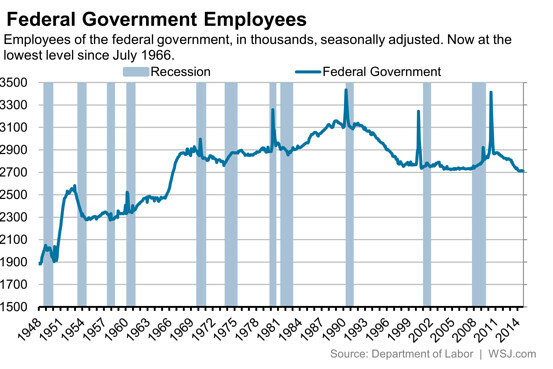 Their graph of federal employees would seem to validate that claim. Now, that’s not the only governmental unit which employs people. The states and local municipalities also chip in and there the picture is a bit different. Does anyone think that block grants from Washington might have something to do with this? Perhaps Washington learned a lesson about out-sourcing from industry. But the article does try and put a happy face on the growth in the states and local governments by noting that as a share of the total workforce government employment at all levels is declining. This, of course, is a fine example of the old axiom that no tree grows to the sky. The article concludes by attempting to explain the contradiction of an historically high level of government spending as a share of the economy with a declining level of employment as a function of increasing transfer payments. The author then concedes that there might be another factor at work. 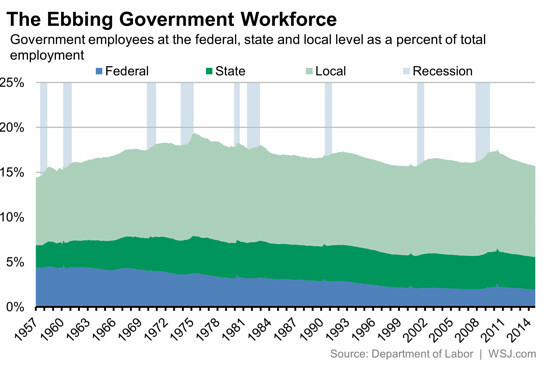 Another reason government spending as a share of GDP remains high, even though the workforce has shrunk, is that government contractors — who may work primarily or entirely on projects for the federal government — are not counted as federal employees. Which leaves us with the question, “How many government contractors are there?” I googled around a bit without finding a satisfactory answer, though what I did come across indicated that this might indeed be a big number. I suppose the best takeaway is to conclude that government employment data comes from government and they don’t have a vested interest in inflating the size of their workforces; we don’t have any handle on the size of their outsourcing; and it’s best to trust our instincts about the size of the leviathin absent all the data. Do read the entire story as well as the link to the memo if you have time. In fairness, State was attempting to provide assistance to local citizens of the Ebola affected regions who are US government contractors. Still, as a matter of simple politics, particularly a week before an election and in a nation clearly nervous about the disease and its spread, this has to rank as one of the more inept moves ever. It would be easy to suggest that this is just another example of an administration which cannot get out of its own way, but that would be shooting fish in a barrell. I think it’s a perfect example of a government which is so bloated and so in search of anything to justify much of its unnecessary apparatus that it runs amok in this manner. There is little to fear in this silly exercise, but that doesn’t mean the next time these people won’t do real harm. 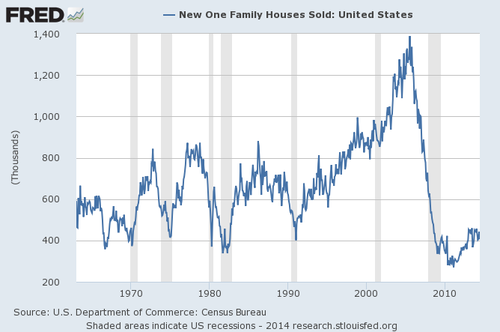 Sales of new single-family houses in September 2014 were at a seasonally adjusted annual rate of 467,000, according to estimates released jointly today by the U.S. Census Bureau and the Department of Housing and Urban Development. This is 0.2 percent (±15.7%)* above the revised August rate of 466,000 and is 17.0 percent (±20.6%)* above the September 2013 estimate of 399,000. The Commerce Department’s monthly estimates tend to be volatile, often are revised significantly and typically come with enormous margins of error. Sales rose 0.2% in Septemberfrom the prior month, the latest report said. But that figure came with a margin of error of 15.7 percentage points. So it could be up 15.9%, or down 15.5% — your guess is as good as ours. August was a good month for new-home sales. They rose a robust 15.3% from July. But the initial estimate of sales (reported a month ago) at a seasonally adjusted annual rate of 504,000 was revised down this month to 466,000. The month still saw a solid gain, because July and June numbers were revised down. But the 15.3% gain came with a margin of error of 16.3 percentage points. So sales could have been up a tremendous 31.6% — or down 1%. Take your pick. No need to belabour the point, so let’s take a look at the bigger picture which isn’t pretty. To find a year in which new home sales were lower than the current run rate, excluding the 2008 recession years, you have to go back to 1982! Oh, and as the WSJ points out in 1982 interest rates were at 15%, unemployment was over 10% and the US population was 232 million versus 315 million now. Take a look at this graph from the St. Louis Fed for a better feel as to just how woeful the business of building new homes has become. I know that everyone has his pet theory about what’s wrong – demographic shifts, income inequality, student loans, tight credit and on and on. All valid and logical arguments, yet the 80’s, and for that matter other periods after recessions, also involved headwinds which didn’t deter strong rebounds. This time it’s different and the reason(s) aren’t that obvious. Based on the duration of past upticks in construction, it looks as if time is running quite short to get back to historical norms.